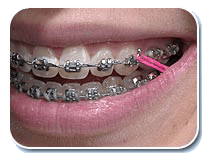 We may ask you to wear elastics of various configurations on braces. It is an essential part of the treatment and success depends on patient cooperation. Why are they used? They add an extra force to the braces to help move the teeth. For example, if the upper teeth are too far forward and the lower teeth are too far back, rubber bands may be stretched from the upper front teeth to the lower back teeth. When are they worn? They are worn usually at all times except when eating or brushing. Part time wear may be recommended. 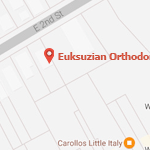 Dr. Euksuzian will determine a schedule. It is important to be consistent; the elastics will not work as well if they are not in place each day. When are they changed? Elastics are replaced at least three times each day or they will lose their snap. Be sure to pick up plenty at the office. Carry a supply of the elastics with you at all times so you can replace one immediately if it breaks. A few days without them can cause a serious set back. Are there different sizes? There are many sizes, each designed for a specific purpose. Wear only the size provided. What can be expected? The teeth may become sore when elastics are first used. This soreness will be gone in a few days. The teeth may become loose; that is a normal reaction to the elastic force. Expect to see progress; look for it carefully. Why are they important? They have to be worn if the treatment is to be successful. The patient must help with this part of treatment in a substantial way if there is to be progress. It requires hard work, even though elastics are not comfortable. If elastics are worn one day and left off the next, your teeth will set up resistance that will slow or even stop your progress…. And discomfort in your mouth will increase. If elastics are worn one week and left off one day, your teeth could shift back to their original position. What is your responsibility at each appointment? At each appointment check that you have sufficient elastics to last until the next appointment. If you run out of elastics call or phone immediately, never wait until the next appointment. We will mail them to you if it is impossible to pick them up at the office. Always be sure you understand exactly where each elastic hooks in the mouth. A final thought. The patient is in total control of this part of the treatment. 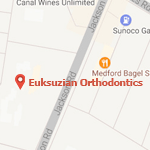 The orthodontist has designed the treatment to proceed in a careful manner and is dependent upon the patient’s cooperation for success.